Our House has an Anchor: A Life Jacket, Eh? Over the past two weekends, Eric and I have been preparing for the arrival of our daughter. We've done all of the things land-based expectant parents do (purchased car seats, stocked up on diapers--we even bought a new car), but since we live on a boat, we also had to find items that will allow us to sail with our daughter. Not surprisingly, the most important thing we had to get was a life jacket. 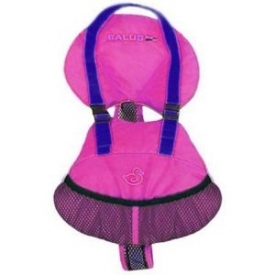 The Bijoux Baby Life Vest is much more robust than anything we were able to find locally in stores. It is designed around the shape of an infant's body, as opposed to other infant life jackets, which are merely scaled down versions of adult vests. The Bijoux Baby Life Vest's design accounts for an infant's inability to maneuver strategically in the water by ensuring that the baby floats face up should they happen to fall in. It also has a special 3-piece collar that supports the baby's head when the child is lifted out of the water by the straps. In addition, this vest is also comfortable for the baby to wear outside of the water, and considering our plan is to keep our daughter in the boat, her comfort while dry is also extremely important. Now that we have a life vest that we can feel confident about, we are ready to set sail with our daughter...the only thing we are waiting on is her arrival.